Food Allergy Awareness Week runs every year. This year, Food Allergy Awareness Week is running from the 13th until the 19th May. The idea behind the awareness week is to help raise knowledge and understanding of different food allergies and anaphylaxis. Food Allergy Awareness Week brings together multiple organisations, charities and individual. All of whom highlight the importance of allergen awareness and aim to reach a wider audience. There are many notable events taking place during the awareness week. For example, the Empire State Building is turning the colour teal in honour of the week. Other activities are encouraging children to be helpful to their friends with food allergies through the PAL (Protect A Life) event. Food allergies can be dangerous and even fatal. Worryingly, someone in the world is admitted to hospital every three minutes as a result of a food allergy reaction. With this in mind, it is vital for everyone to have an awareness of what to do in a food allergy situation. Furthermore, the food industry must make sure that all products explicitly label products to reduce the risk of an allergic reaction. 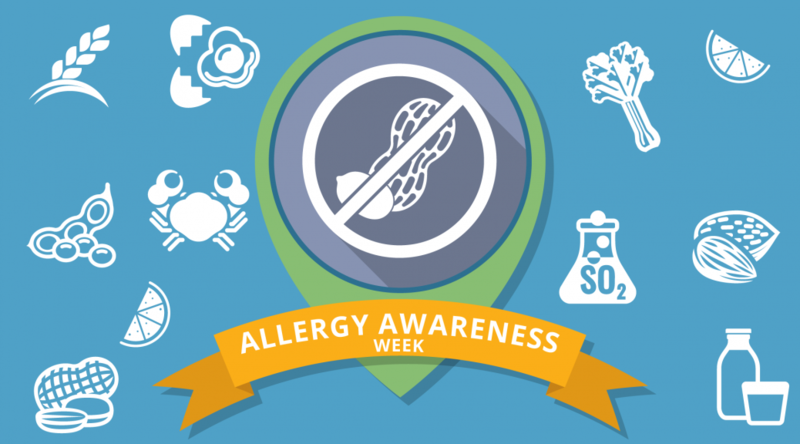 With Food Allergy Awareness Week, it is the perfect time to offer your clients the chance to learn more about the severity of allergies with an Allergen Awareness course. We have created a succinct and engaging Allergen Awareness e-learning course that we can fully brand to suit your organisation. The course offers a detailed overview of the 14 allergens that are controlled by legislation. It is the ideal course to complement any work that organisations are doing to highlight Food Allergy Awareness Week. If you would like to offer your clients an insightful course on Allergen Awareness, then click here for your free trial to see the training for yourself.